One summer morning, three little girls meet for the first time. By the end of the day, two will be charged with murder. I’d been reading the buzz about this debut novel on twitter for a while now and, with the outside world becoming increasingly chilly and deciding to spend some time wrapped up indoors with hot coffee and a chilling read, this seemed to be a suitable choice to tick all the boxes. It’ll be hard for anyone based in the UK to read this cracker of a novel from Alex Marwood (a pseudonym for a UK press journalist) without reflecting on the tragic case of Jamie Bulger from a few years back – a case which cannot go unmentioned within the book itself as it treads similar distressing territory. 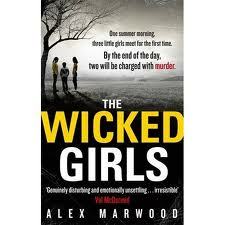 With the new identities that both girls have been given and have lived with for twenty five years suddenly threatened and bringing them crashing together again seemingly by chance, this is a book that will surprise the most jaded of crime fiction readers with its superb and skilful plotting. It’s been a long time since I can remember a crime novel bringing all of the threads together in such a successful and thrilling way in its closing chapters. You will be led by the hand by Alex Marwood’s characters through this heartbreaking, thought-provoking and chilling thrill-ride through the darkness, but I cannot reveal here just where they are taking you. I think this book definitely has to go on my TBR list! I thoroughly enjoyed this book its a definate one to read.